I know it’s been awhile, but I’ve been busy! I’ve applied to the Louisville, Kentucky art fair. 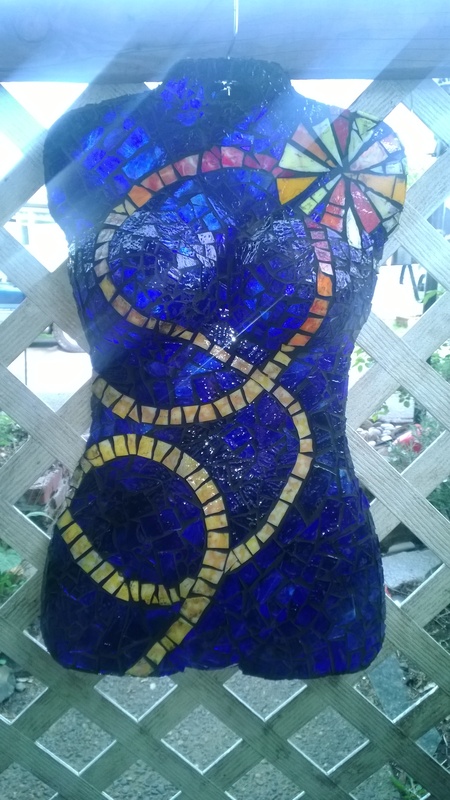 If I get in, with my mosaics, I think I can sell them and gather some commissions, too. I’ve also gotten a new gallery that I’ll be delivering art work to, the weekend after next. I’ve been working on the form for the orca. I was going to use expansion foam, but that stuff is expensive stuff, so I’ve been working on the cardboard form, getting it just right. Then I’ll coat it in plastic and fiberglass it. Before I do that, I have to finish the dorsal fin and the two pectoral fins. I’ll attach them to the form and then fiberglass over them. In the mean time, I’ve also been working on some girls. I have two very close to completion, Persephone in Bloom, and Joy. Persephone is going to have a companion piece, I think. Persephone, after the Fall. It will involve greys, browns and a smidge of red for the pomegranate seeds. I think I’ll also make some felted pomegranate seeds, for the sides. Persephone in Bloom, after grouting. This entry was posted in Uncategorized and tagged art glass, art glass mosaic, glass, illuminated art glass mosaics, joy, persephone. Bookmark the permalink. That’s amazing! Is it fully three-dimensional?